Dogs need to interact with us in order to have a healthy life with us. They really only repeat behaviors that work out for them. If we want them to be well-behaved dogs, we have to reward the appropriate behaviors. That is why it’s so important to make our dogs want to spend time with us. If we spend fun time with our dogs, we can catch them doing things we like. If you want to make your dog want to be with you, food isn’t the only way to reward or motivate your dog. Pick something that motivates your dog; a toy, a tug, a tennis ball, a flirt pole. Don’t expect them to play with it on their own, playing is a two way street. One way to make your dog want something is for them to see you playing with it, anything, even a water bottle can be a fun toy if you give it value by playing with it. Tease them or play with it on your own or with whoever else is there. If you give something value by playing with it on your own, your dog will want to play with it too. I had a “waggiest tail” contest the other night in one of my classes to see who had the waggiest tail. I encouraged the owners to reward their dog with play instead of a treat for a few behaviors. I was not too surprised to see that most of the dog parents were doing a good job playing with their dogs. It is important for dogs to socialize with other dogs. But, it is just as important for them to learn to play with us in healthy ways. Nowadays, a lot of dogs learn play skills from other dogs, not us. Dogs crave interactions with us. These interactions become a great opportunity to shape the behaviors that we want. Imagine if our dogs got to play with us only if they acted appropriately. One way to use this method appropriately is with nipping and mouthing behaviors. Whenever I play with my own dogs, no teeth are allowed. I also try not to use my hands as a play toy. Retrieving and chasing the flirt pole are two methods I use to play with my dogs. The second teeth hit skin, the game is over. My dogs have learned that putting teeth on skin is a surefire way to make play stop. As a result, my dogs don’t use their mouths to play with me. 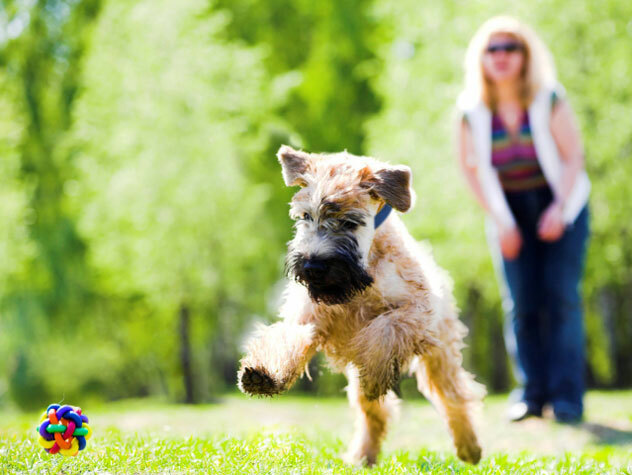 Using play as a method to train is a great way to a healthy, happy, fun relationship with your canine companion.